Security footage shows Tom Anderton using a rear naked choke to defend his store. If you’re thinking about shoplifting, it might be a good idea to do some research. Make sure the owner isn’t an MMA fighter. A would-be crook in York, Pa., didn’t do his due diligence and paid for it - with a black eye and bloody mouth, according to ydr.com. Shawn Frazier allegedly pulled a knife Saturday on a music store owner Tom Anderton when Anderton accused him of shoplifting - which he was. Anderton, a trained MMA fighter and boxer, jumped into action, grabbing the man’s arm as two other customers jumped him. The two others wrestled Frazier to the ground as Anderton punched him in the face. Anderton then put Frazier into a rear naked choke and made him sit on the floor until cops arrived. "I’m shook up a little," Anderton told the website. 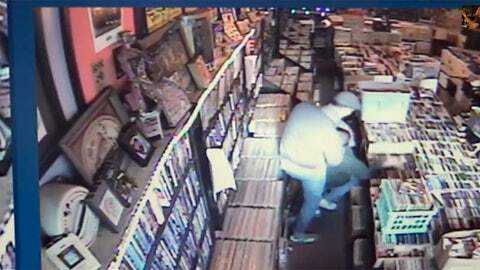 "I’ve had shoplifters before but nothing violent like this. I worry about what could have happened." Well, yeah. Especially since fighting a man wielding a knife might not have been worth it - the contents of Frazier’s pockets, a DVD and a cassette tape, were worth less than $20. Plus, Anderton’s 12-year-old daughter was in the store and his two other daughters had just left. "What if they all would have been there?" Anderton said. Frazier, 45, was acting oddly, hanging out in the store for almost two hours looking through CDs, DVDs and video games, according to charging documents. Anderton said he spoke to the man twice about putting things back in places they didn’t belong. When Frazier came to the counter to pay, Anderton noticed merchandise in the man’s back pocket. "I just grabbed them," Anderton said. That’s when Frazier pulled out the knife and things got dicey. "He had to be about a foot away from my stomach," Anderton said. So, he snapped into action. Brave, yes. Wise? Maybe not so much. Luckily, there were too equally brave customers in there, too.